Daylight Saving ends next weekend! Looks like heavy nights this week. Meditate! 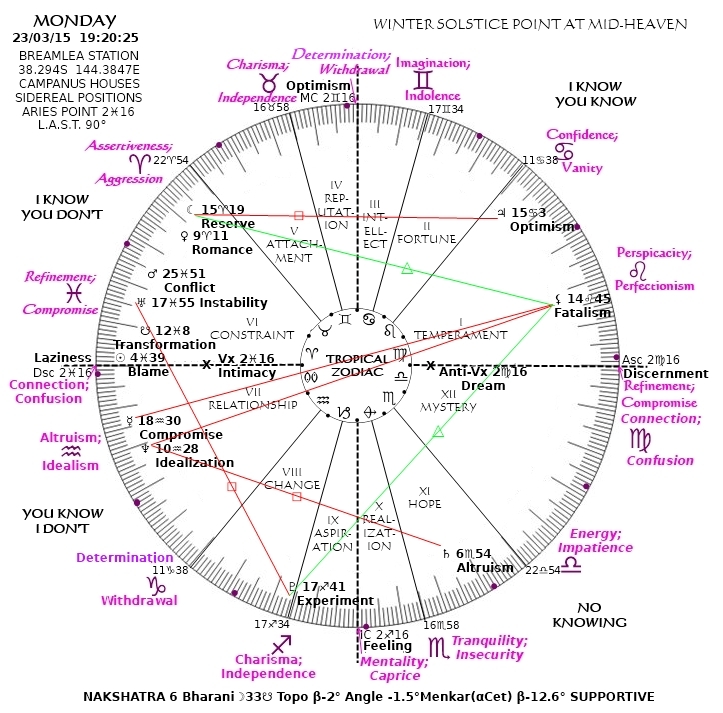 Yes, there is a timeless harmony between tropical and sidereal astrology when the ecliptic pole aligns with the celestial pole, and I promised to give you a weekly chart of both daily moments, but I’ve changed my mind. My prime concern is that too many armchair experts never go out and have a look, and I’m only encouraging that by creating charts of daylight hours. Sidereal Time 270° it is then, until September–remember sidereal time for angular relationships gets earlier every day by 3mins 56secs, and by September the Summer Solstice Point will be at the Meridian before sunset–but we need an additional moment to follow if we can be coaxed out under the sky in the evenings. The South Pole of the Ecliptic revolves around the South Celestial Pole, which is your latitude above your horizon, in a clockwise direction, at an angular distance equal to the tilt of Earth’s axis of rotation. The Ecliptic arcs across the northern sky in ever-changing orientation to the horizon, but when its pole crosses the Prime Meridian due south, the points on the Ecliptic at its intersection with the Celestial Equator, the so-called Aries and Libra Points, align due east and west with the horizon. This occurs at sunrise and sunset at the Equinoxes, and 3mins 56secs earlier each day. I will post a weekly chart of each as the year progresses. Only the Vertices will stay the same, because their manifestations are according to house, but they too will vary across the horizon, because the moment I’m going to freeze is a nanosecond. 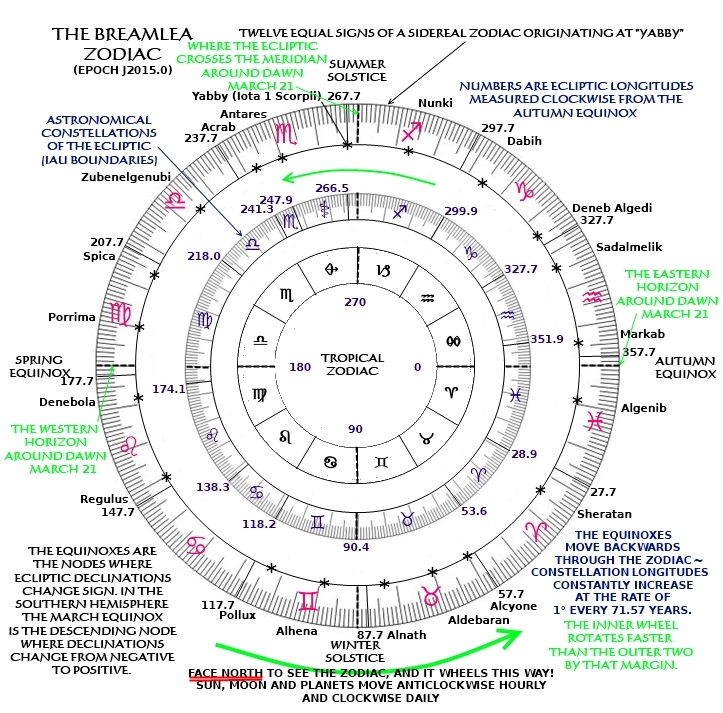 Facing the Zodiac, East is to your RIGHT, and as a result of the CLOCKWISE rotation of the Earth towards the East, the Constellations move ANTICLOCKWISE across the sky, and the Sun, Moon and Planets move CLOCKWISE through the Zodiac. The “Reflections” of the Constellations are an attempt to use confirmation bias against the silly habit of analysing Southern Hemisphere psyches against the backdrop of Northern Hemisphere seasons. 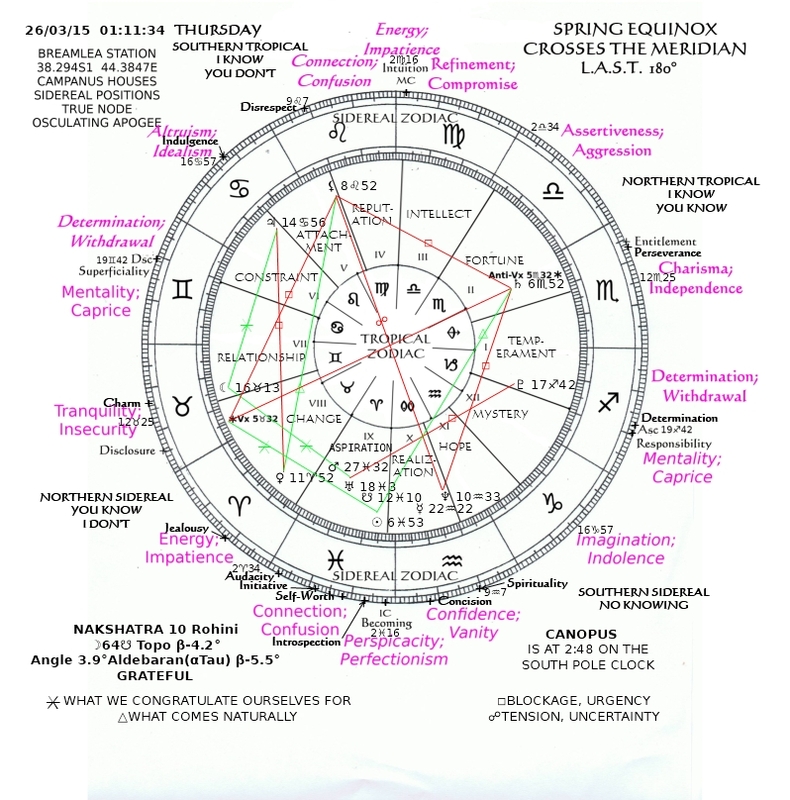 Houses I-III give Northern Tropical interpretations, Houses IV-VI the opposite Tropical interpretations; Houses VII-IX identify the Constellations with their Signs, and Houses X-XII the opposite Signs. This arrangement is entirely arbitrary, although it has an aesthetic value for me in incorporating CHANGE. Pop music gives us the clue. Something is wrong with our heart. Even if she loves us truly, forlorn hope since we don’t know who we are, it cannot last forever. In that case, dance! We want something to last forever so we detach our heart from the body and call it love. The physical world has an analogy for our mad practice: it’s called the obliquity, the tilt of the Earth’s rotational axis to its orbital plane. The wanting something to last forever is dukkha, the anti-vertex, and the detachment we call universal love is anicca, the vertex. 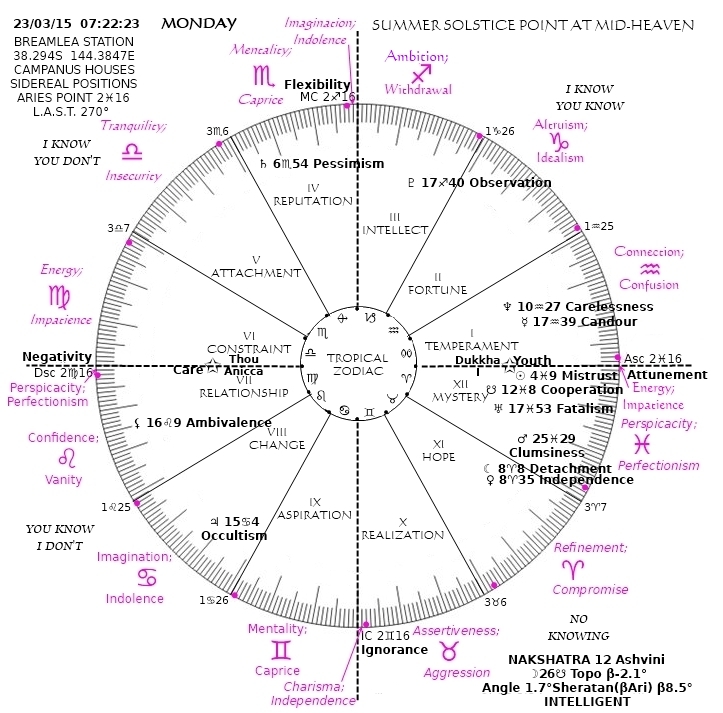 Twice a day these angles of rotation to revolution coincide with the prime vertical at the horizon, when the solstices are at midheaven. Twice a day we strut the impossibility of eternity, and twice a day you think you’re wise to it. How can an imaginary geometric point resonate with my feelings and emotions? How can I assert its existence in nature? For what purpose would I create aspects of an angel in the sky or a horror beneath the earth, other than to confound or at least challenge my flimsy intellectual understanding of gender, sexuality and heart, and yours? What in fact does exist in nature, and by what sign does it announce itself to you? Canopus is a good example. Do you know it? If I told you the Ecliptic South Pole lies roughly halfway between Canopus and the South Celestial Pole would that help make the Ecliptic viscerally real to you as the Equator of the Solar System back over your head? 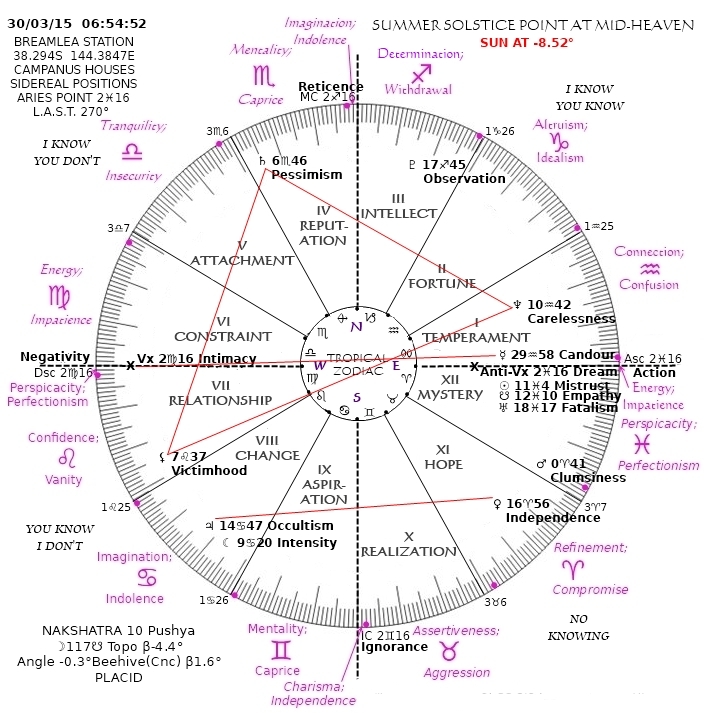 Perhaps we should exercise caution with the demand that astrology source itself in nature? 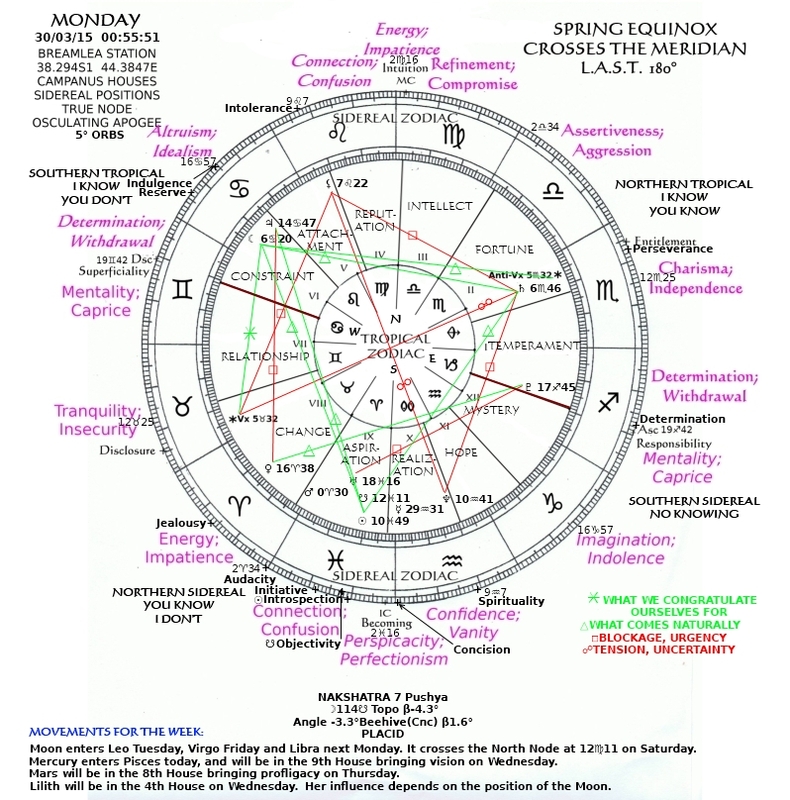 Don’t worry about progressing natal horoscopes. They’re almost irrelevant. Your universe had a name when you were born and a nature, but that has changed, and not because of any influence by the stars or the seasons, unless you have been influenced by your daily horoscope from somewhere, and modelled yourself on your astrological type. The universe has changed because it exists in time. Each moment is a self-transformation, a breathing in of what is breathed out, new things made of old things, old things made of new. The past evolves its relevance out of the present as it asserts itself as context in structure and law. The past is the present’s food, and the present’s digestive system is synchronized, adapted as it has always been. This is how your nature has evolved. You have chewed yourself up and spat yourself out a million times. You taste different, your appetite is different, your digestion is different, your teeth are different. If you’re my generation, you no longer sit down to dinner at noon and eat tea at night, but, horror of horrors, you eat lunch at noon, American-style, and your dinner you eat at night! None of this was caused or foretold by the stars or implied by your nature. The universe is not subject to immutable laws which exist outside time. Your nature is to deal with your changing environment the best way you know how. It is not to influence it or keep it the same. That’s your attitude, which wasn’t ever written in the stars. The purpose of life is to persuade the past to exist, and the present to behave. 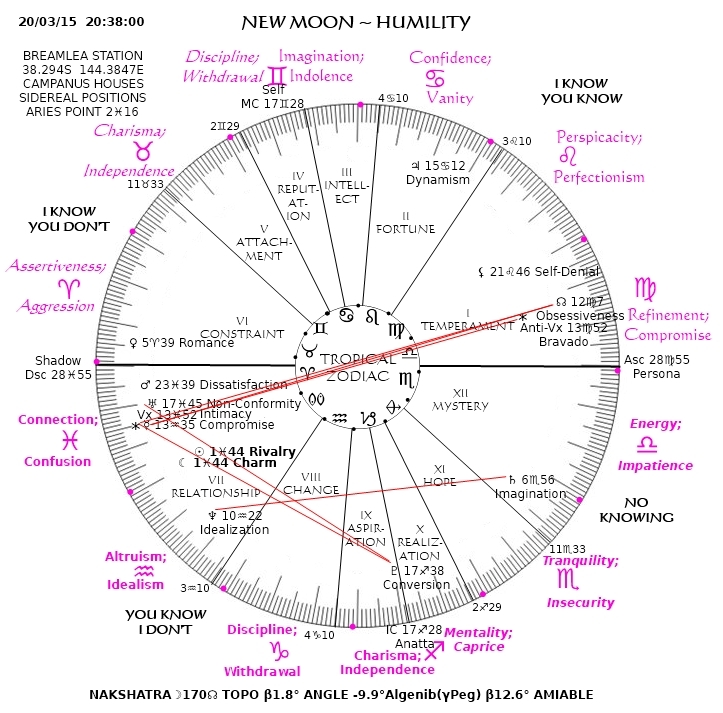 That is the nature you were born with, whether the spring equinox is in March or September, Pisces or Aries.